Exquisite dining in paradise… Savour it! Our restaurants and bars take full advantage of the resort’s secluded location, as well as Sharm El Sheikh’s romantic sunsets and starlit nights. Offering a variety of world-famous cuisine, innovative menus and local flavors, graced by impeccable service, our resort guarantees to delight your senses in every way. 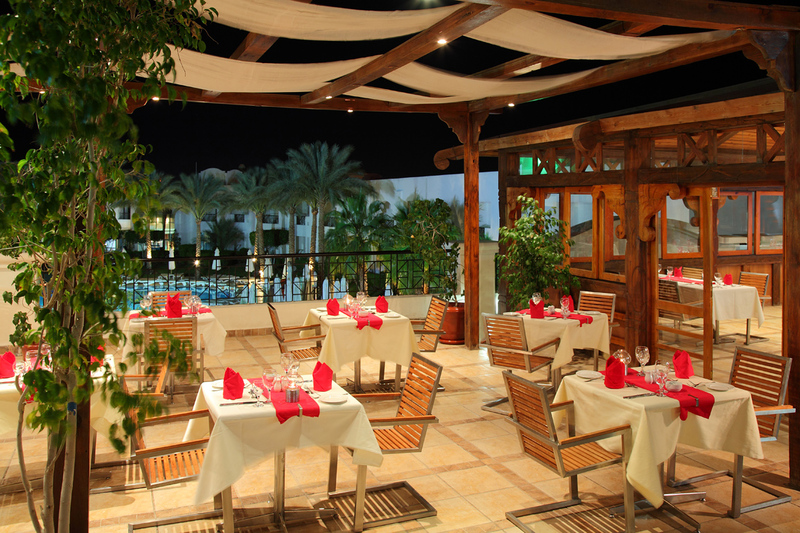 With a tranquil ambience inspired by the sea’s blue hues, La Princesse is our main restaurant to satisfy your appetite. Our buffet offers an array of fresh and tasty dishes ranging from famous oriental delicacies to tasty international dishes. Combining French quality with German quantities, the Belgian cuisine offers a variety of national delicacies to suit all tastes. Select from a wide range of specialty dishes ranging from fresh mussels with fries, Belgium’s good old fashioned cream eggs and meat stew, while enjoying fine wines and rich Belgian beer served against a breathtaking pool view. After a long day of fun in the sun, take your loved one out on a rendez-vouz in our cozy lobby bar to feast on exotic cocktails, refined wines and alcoholic beverages guaranteeing a prolonged night of enjoyment. Our soothingly lit and earthy interiors ensure you connect with the resort’s magical surroundings. Relish in refreshing cocktails or light snacks as you spend the day lounging on the pool at any of our stylish bars, designed in a tropical oasis style to quench your thirst. Step into the home of oriental hospitality at Dawar El Omda, resembling local mud-brick dwellings, guaranteeing an authentic experience that will last with you a lifetime. Savor flavored aromas as you sample our "Shisha” while sipping on mint tea in a local atmosphere of ultimate simplicity.